Last edited by Jugg2Driver : 10-22-2014 at 11:43 AM. wheres that darn like button! So now that you've seen the Axial Yeti XL in the videos above lets talk about it. My take is that it is a combination of an 1/8-1/6 scale buggy crossed with a monster truck. Let's face it, this is a whole new beast to contend with for the R/C world. As far as I know it's the first large IFS and SRA vehicle available. In our scale terms think of it as an XC on crack, meth, and a personality disorder all in one! It's a hell of a thing!!! Well, that's a good question. It does whatever the hell it wants! With a rig of this size with the screaming banshee power that it has, there isn't much that it can't do. Obviously with both front and rear open diffs it's not going to be the best crawler. And with the Castle Creations 2200KV 4-pole Vanguard XL brushless motor with the Vanguard AE-4 XL ESC providing the all that power I have noticed that it's a little twitchy with the low speed minor throttle inputs. That could be either all the banshee's just trying to escape or the fact that I'm used to far slower crawlers where the full throttle range is used for moving at a walking pace to moving at a slower walking pace. So, what does it do? It's goes like hell, that's what it do!!! Well, the simple answer is...everything! The Yeti XL is a completely new from the ground up. New chassis, new driveline, new category, it's all new. But what's new that's worth noting? Ah, well there are a few things that I think are worth noting. First is the abundance of CVJ's or Constant Velocity Joints. Normally you see CVJ's on the front of large rigs due to their efficiency and durability but axial has thrown an extra set in on the Yeti XL. The rear driveshaft is now a CVJ rather than what we're used to seeing with an output shaft to which the driveshaft is bolted. According to Axial this set up results in less slop, increased surface area connection at the joint, and Captured cross pin design eliminates older set screw design for more durability and easy maintenance. Axial has also introduced a new 2 speed transmission with high and low gears. The truck comes equipped as a single speed with the high gear installed. The two speed component can be purchased separately. I could see this trickling down into other vehicles in the future. Axial also provides harden steel CNC cut metal gears in both front and rear diffs for extra strength and durability. That really depends on what you're used to driving. If you're used to slow high torque crawlers then the Yeti XL is going to be like stepping out of your Yugo and into a McLaren P1. You're going to have to learn how to handle all that power and control the throttle. But if you're used to fast brushless setups then you won't have much of a learning curve. You'll just have to find terrain the fully exploits all the capability of the Yeti XL. The Yeti XL will be excellent fun at your local track as well as being a blast on any trail you find. Nothing significant at this moment, but if you've watched my videos you'll note that I mentioned two things that I've noticed after two runs. The battery/esc leads could possibly get caught by the front wheels. For this I think a well placed zip-tie will solve this issue so I'm not so concerned with this. The other being that slight twisting I've seen in the rear driveshaft. At this point it is extremely slight and could possibly just be a manufacturing defect but it's something I'll have to monitor as I run. That is between you and your wallet or significant other. At $699.99 MSRP the Axial Yeti XL ain't cheap. But you do get a lot for your money if you factor in the brushless set up, all metal gear servo, 2.4ghz 3-ch receiver, 2-ch transmitter, and the high end parts that come installed. Last edited by Jugg2Driver : 10-26-2014 at 10:42 PM. CVJ = Constant Velocity Joint. Unlike a universal joint which speeds up and slows down each revolution a CVJ rotates at a constant speed. This makes then usable in permanent four wheel drive applications on road where wheel slippage doesn't happen (typically). For example, old Series Land Rovers had UJ's in the front axles and part time 4WD. Later land rovers with permanent 4WD have CV's. You are correct, thanks for pointing that out. Lets look at what you need to make the large everything last to the power that your paying for. The servo needs to be at 400oz or better really. The plastic drive shaft maybe, the rear trailing arms most likely. Then there is the steering and front end parts that will need to be upgraded. I have tires this big on my 1/5 scales and you should see the size of everything to stand up to large tires. I'm willing to bet that most people will use smaller tires just to keep gears in it. There new and time will tell but i'm rarely wrong about this stuff. I'm waiting and will buy one but the bugs will be figured out before I sink my money on one. 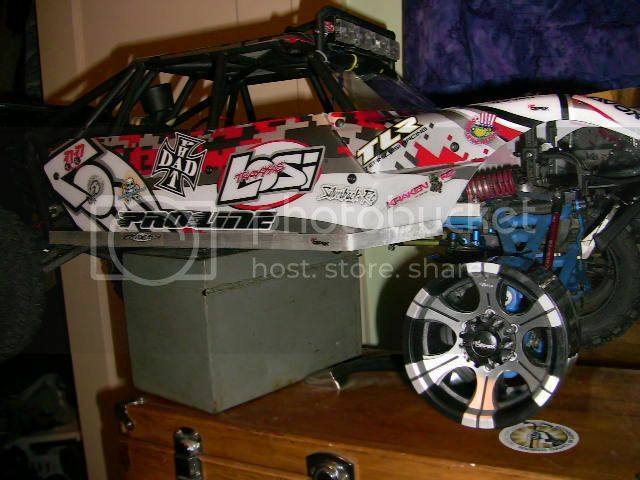 I will stick to building rc's and trying to better what I have much like the Revos that I'm working on. Last edited by twissted : 12-03-2014 at 08:43 PM. That Yeti XL is awesome! I've heard it comes in a much more durable form also than it's smaller sibling. Though I imagine that you'd have fewer people to run it with at 1/8 scale. Thanks for the vids! Also, weather permitting, it would be great to see a video of this car's crawling capabilities. Isn't it supposed to be a basher with some crawling capabilities, albeit limited without a solid front axle. I have not see any such footage on YouTube. The latest news....Now it's a kit! i picked up a yeti xl kit my self while on the road. got it finished after picking up 2 missing parts at a hobby shop on denver. have to say...........very impressive truck! when i hold that monster up, people assume its like a 1/4 scale due to biiiiiig truck held by a little round woman *blush*./ i put the castle mamba monster v2 and the 2200kv motor,lotta powah even on a single 30c 4s 3200 flight pack. use that cuz my big 4s is too big. i may take it out to the beach today for some dune shredding. we'll see how it does there.